Kentaro Miura has a reputation for his excellent artistic skills, grim yet compelling writing style and... obsession over Idolm@ster that gets in the way of his own work? OK, that last one is exaggerated a little but for whatever reason he isn't great at keeping up with a regular publishing schedule, much to the annoyance of his fans. But maybe he'll start getting back into the swing of things soon. 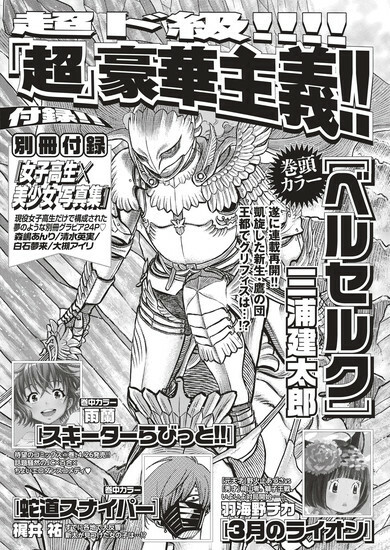 Hakusensha's Young Animal magazine, which has hosted Berserk since it started 30 years ago, has announced that Miura's dark fantasy epic will finally be returning with its 373rd chapter in total. The last chapter was released in August 2018. Readers who are up to date with the manga will know that a certain someone went through a pretty important awakening in a recent chapter, but we haven't heard from that particular plot thread in a while, with the story focusing on Griffith's war against a race of giants instead. The preview image used in Young Animal proudly displays Griffith, so it looks like it'll be some time still until we learn what Guts & Co are up to. And that's assuming the hiatus is officially over and Miura won't give up again for a year or two. Episode 358 of Berserk will be published in August's edition of Young Animal, and it'll only be a matter of time until it finds its find its way online. Are you excited for the return of the series? Do you think it's back for good or will it enter hiatus again soon? Let us know what you think in the comments.